It’s a pun, ok? It’s late, and I’m a little tired, but the bins are done. I do need to get enough summer clothes put away so that we can get what we are wearing into the drawers, but at least the winter stuff has been given out. And not a day too soon, as it’s getting down into the 20s tonight! I was able to get it done because there was no girl scout meeting today after all. I’m showing you a picture, even though it’s embarrassing. 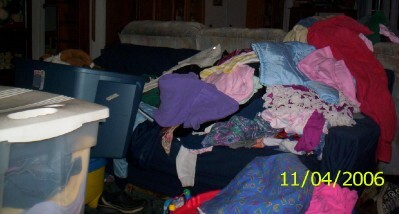 Doesn’t it look like the laundry monster vomited all over the couch and floor in here? Ah well, it’ll get done, and I don’t like the babies to wear clothes that have been stored until I wash them. This entry was posted on November 4, 2006, in cass cleans. Bookmark the permalink.